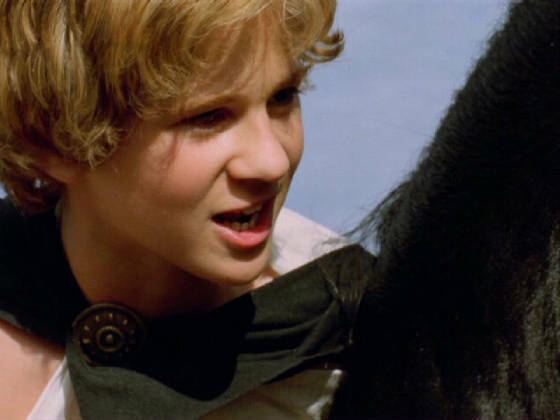 THIS RARE CONNOR PAOLO INTERVIEW WAS PUBLISHED ONLINE SEVERAL MONTHS AFTER ALEXANDER OPENED. The movie Alexander, directed by Oliver Stone and released in November, is filled with adventure, drama and war as it follows the Macedonian conqueror Alexander from childhood to death at age 32. One of the most important milestones in Alexander's life occurs during his teen years in ancient Greece when he meets his life-long companion Bucephelus, his horse. Connor Paolo plays Alexander as a teenager in this major motion picture. During a recent interview, Paolo, 14, told Static that acting in such a massive, large-production film gave him a "rush that you can't explain. It's the ultimate high which includes pressure but . . . it's nothing compared to the pay-off you get in the end." Paolo worked with many big Hollywood names on the film, such as Colin Farrell, Angelina Jolie, Val Kilmer, Jonathan Rhys-Meyers and Jared Leto. Paolo also told Static that he has appeared in the film Mystic River, the TV drama Law & Order and the soap opera One Life to Live. He started acting when he was 9 and studied at the Lee Strasberg Theatre Institute. He now works with acting coach Peggy Lewis. On Stone's set, Paolo said he felt the director loved the content of the movie so much, it made Paolo feel his acting craft was essential. Throughout the movie, Paolo was accompanied by a legal guardian on the set and said the working laws for young actors require no longer than an eight-hour work day. The young actor lives in New York City with his parents and has a large family. He goes to a high school on the West Side of Manhattan when he isn't working. Paolo is just like any other regular teenager, enjoying going to the movies and playing sports with friends. He likes listening to punk music but also hip-hop and old rock. He enjoys watching all kinds of films but doesn't have a favorite. When asked about his favorite television show, Paolo said, "Definitely, The Simpsons. They are the best!" When he gets a role, Paolo's agent will share what she thinks, and then Paolo decides whether to turn it down or go ahead with the project. At this moment, Paolo has no other acting plans but said he has turned down many roles. During the interview, Paolo gave some last words of advice to other young actors. "Know that you're going to get knocked down a lot, and know that you're going to have to deal with a lot of pressure. Just trying your best and believing that you can do it doesn't always cut it. But if (acting) is really where your heart is, then go for it and work your best."